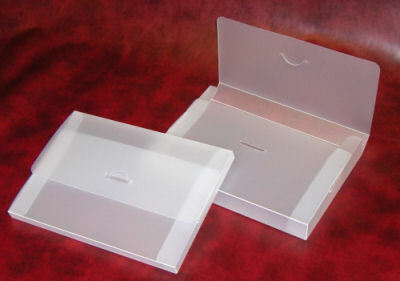 A5 Document boxes in frosted clear polypropylene. Tel: Donside Pockets on 01302 288960 to order. A5 Document Boxes. Ideal for holding loose papers. Frosted clear polypropylene document boxes, with flap and 'D' tab closure, are available for A5 paper in three capacities from stock. They are also known as Euroboxes. The manufacture and sales of these Document Boxes is now with Donside Pockets. of Doncaster. Please ring 01302 288960 or contact Donside Pockets. A5 Document boxes in frosted clear polypropylene. Please note these are supplied flat for you to fold and assemble. Product ref: A5FDB12/8 = 12mm paper capacity (A5 sheets). This item is small enough to be posted UK Royal Mail 'Large Letter' rate. Product ref: A5FDB25/8 = 25mm paper capacity (A5 sheets). Product ref: A5FDB60/8 = 60mm contents capacity. This box is taller than needed for exact A5 (180mm high approx.) and will accept our A5/PP/CH job card holders. All are manufactured in 750 micron frosted clear polypropylene and are supplied flat for you to fold and assemble (tab assembly). 750 microns = 3⁄4 of a millimetre (1mm = 1,000 microns). Takes A5 paper. 12mm capacity. Supplied flat for you to fold/assemble. Please note our polypropylene document boxes are now available from Donside Pockets on 01302 288960 or just click the link, it will take you directly to the new web site. As above but 25mm capacity. Supplied flat for you to fold/assemble. For A5 paper and card holders. To order please telephone 01302 288960. Please have your debit/credit card ready (not American Express). A6 Document Boxes. 15mm and 20mm capacity boxes also hold 6" x 4" record cards. Specification as per the A5 boxes above, supplied flat for you to fold/assemble. Product ref: A6FDB9/8 = 9mm paper capacity, A6 only. This item can be posted Royal Mail 'Large Letter' rate. Product ref: A6FDB15/8 = 15mm paper capacity, A6 or 6" x 4". This item can be posted Royal Mail 'Large Letter' rate. Product ref: A6FDB20/8 = 20mm paper capacity, A6 or 6" x 4". This item can be posted Royal Mail 'Large Letter' rate. (This item used to be classified as 18mm but 20mm is more accurate). Product ref: A6FDB24/8 = 24mm paper capacity, A6 only. Takes A6 only (not 6" x 4"). 9mm capacity. Supplied flat for you to fold/assemble. Takes A6 paper or 6" x 4" cards. 15mm capacity. Supplied flat for you to fold/assemble. Takes A6 paper or 6" x 4" cards. 20mm capacity. Supplied flat for you to fold/assemble. Takes A6 only (not 6" x 4"). 24mm capacity. Supplied flat for you to fold/assemble.